• ALTA/ACSM Surveys – We have extensive experience with American Land Title Association surveys and their requirements. Please do not hesitate to call for details. 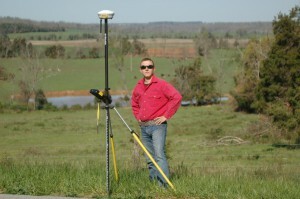 • Boundary Surveys We will research the recorded records for you and your neighbor’s property. Utilizing this research we will mark your boundary as well as produce a drawing of our final opinion. We can also assist if you have an encroachment or other boundary location issue with a neighboring landowner. • Subdivision Design & Layout – We prepare record plats and minor subdivision plats if you are dividing up your property into separate lots. Our engineering department will prepare construction plans, sewer and drainage plans, and roads plans for your project. • Flood Elevation Certificates (FEMA, MSD forms) – We do FEMA flood plain certificates, generally used for flood insurance or to acquire building permits. Elevation Certificates prepared for Homeowners insurance as required by new Flood Insurance reform Act of 2012. • Fence Line Placement – Putting up a fence? We will come out located your property corners and place stakes where you want a fence. If necessary, we will do a partial boundary and set/reset any missing property corners. • Site Plans (Residential and Commercial) We prepare site plans for residential construction, additions, garages or accessory structures as required to obtain a building permit. For commercial clients, we can prepare site plans for commercial and industrial structures in accordance with local requirements including the LDC for Louisville Metro in Jefferson County, Kentucky. • Land Use Planning/Zoning Changes We have experience in processing zoning changes in Jefferson, Bullitt and Oldham County and can guide you through the process to obtain construction approval for your project. • Topographic Surveys We can prepare topographical surveys for your building or construction projects and provide information to you digitally as required for your business’ needs. • Construction Layout (Residential and Commercial) We specialize in new home construction staking and also do construction staking of multifamily, commercial sites, industrial sites, sewer lines, and utility projects. • Easement Plats (Utilities) We prepare easement plats for contractors and landowners as required by local utility companies including LG&E and MSD. • Minor Plats. We prepare minor plats as required by Louisville Metro Planning Commission to divide property or move property lines between parcels in Jefferson County. We also do minor plats in Bullitt, Shelby and Oldham County. Jones & Jones Engineers and Surveyors: Contact us for access to this company’s historical records in the custody of William Jones, P.L.S. 3024.